Also available is the X10 and X10 Mini. 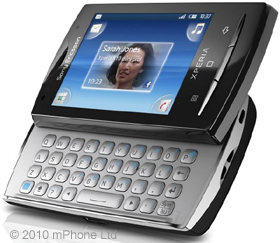 Sony Ericsson X10 Mini Pro SIM Free, unlocked, never been locked, GSM and 3G phone, and use it with ANY GSM SIM card in the world, including those in the USA and Canada as well as any UMTS / 3G SIM card such as from Three. You can use a contract or pre-pay (Pay As You Go) SIM card.